All Welcome bring your Kids and have a Family Day Snags – Burgers – Salads – Drinks Supplied. Extra Salads – Cakes etc. would be appreciated. Cnr Nepean Highway & Plowman Place, Frankston. Food and drinks supplied. Donations welcome. 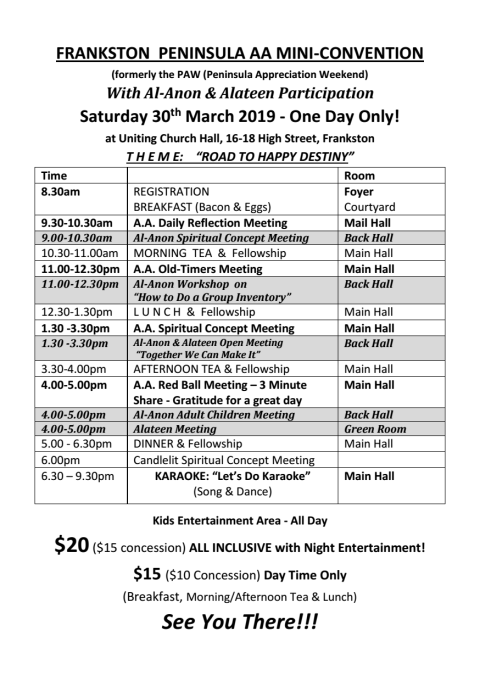 Each year, AA groups from the Peninsula region combine forces to put on weekend of AA-related social activities including a Supper Dance, continuous meetings, Al-Anon activities and much more. Theme: "Awareness, Acceptance & Action"